Ophelia -- Victimized Woman or Femme Fatale? 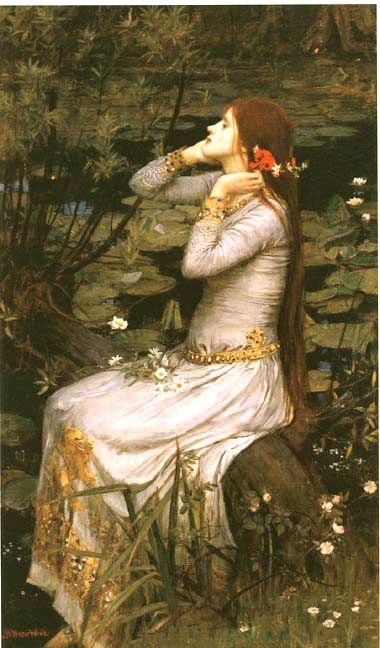 Various members of the Pre-Raphaelite Brotherhood and their followers all depicted images of Shakespeare's Ophelia, the victim of Hamlet's manic behavior. Their artwork reflected their beliefs in Romantic love and a concern for the redundant woman. Ophelia, spurned by her lover and abandoned by the absence of her brother and the death of her father, is driven mad and drowns. Moreover, the portrayal of a woman in various stages of incurring madness stems from a fascination with the concept of victimized womanhood itself. John Everett Millais's depiction of Ophelia remains perhaps the most famous paintings and infamous artistic account. The Pre-Raphaelite stunner Lizzie Siddall posed for the partially submerged woman floating downstream. Millais found a decrepit old dress rich with embroidery for Siddall to wear while lying in a bath full of water heated by lamps. After several hours, the lamps went out and Siddall lay silently in freezing cold water; Millais, completely absorbed, never noticed. The consequent illness of Siddall caused her father to threaten to sue Millais, but they eventually reached an agreement. As Gay Daly writes in Pre-Raphaelites in Love, Millais's Ophelia shows an unearthly beautiful woman drifting "with palms upturned, just breaking the surface of the water, offering herself to death... The image is one of utter passivity." However, in David Sonstroem's Rossetti's Fair Lady, he contends that Dante Gabriel Rossetti's portrayals of a victimized woman did not intend to show her "capacity for such complete surrender" which Millais achieved in his Ophelia. For Rossetti, his numerous paintings of victimized women tried to stir up a chivalric indignation at seeing a woman so degraded. His own charitable nature wanted to help such women, and his sympathies went out to them. In later years, his obsessive paintings of Ophelia point away from pity for the victim and towards Hamlet's despair under the crushing femme fatale. His Ophelias are painted from the memory of Lizzie Siddall, who he eventually married and who died about two years after the event. Siddall was driven to suicide, he feared, because of him. He began to be haunted by her memory, leading to his decline: the beloved betrayed by her lover has now returned for vengeance. In both versions of Hamlet and Ophelia (1854-1858 and 1866), Rossetti revises Shakespeare to show a tortured Hamlet tender in his pleas, though they represent sexual knowledge, and an aloof, innocent Ophelia reluctantly rejecting him. Finally, in The Madness of Ophelia, Rossetti shows a mad, pitiable, yet frightening young woman. The face of his dead wife, driven to lunacy, accuses its own painter.